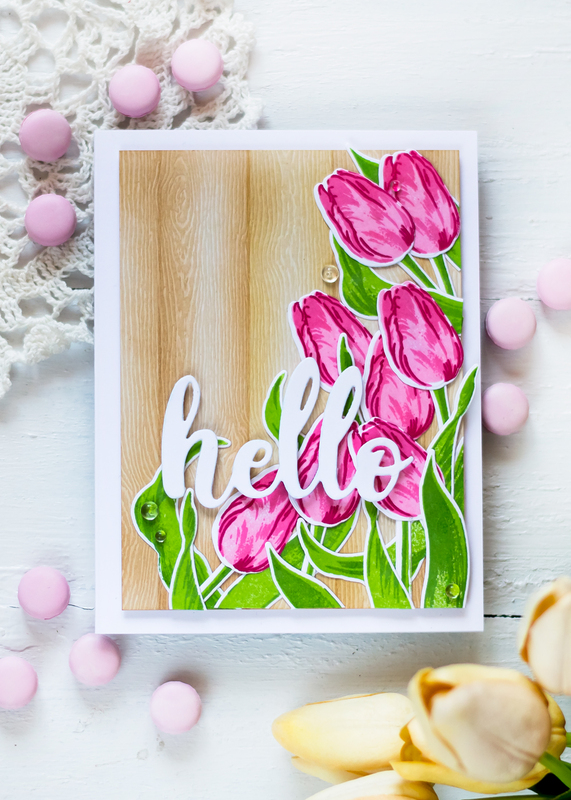 If you follow Altenew blog you probably saw these project before when I did the stamp focus post for the Exotic Tulips Stamp Set. Recently I’m falling behind posting to my own blog but I still wanted to have them here too. 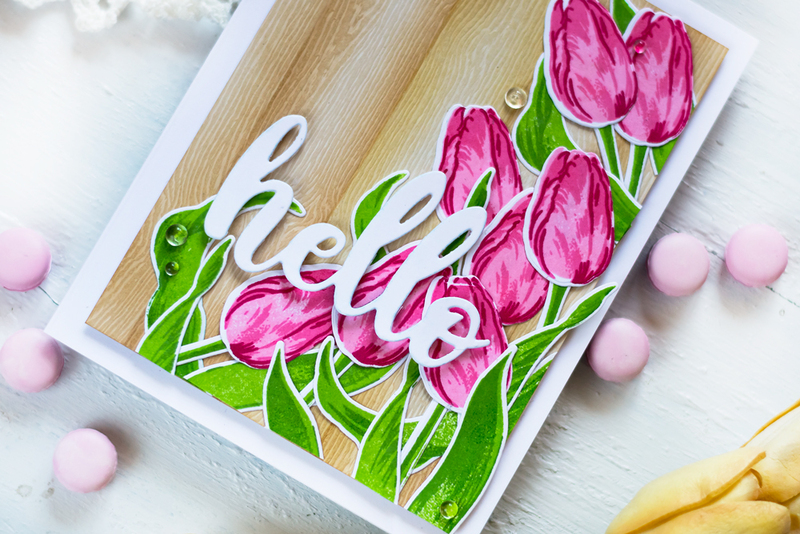 This set is packed with images to stamp three-layered tulips of different sizes and shapes, a stem and two leaves. There is also a couple of sentiments in this set. I made three cards using this beautiful set. 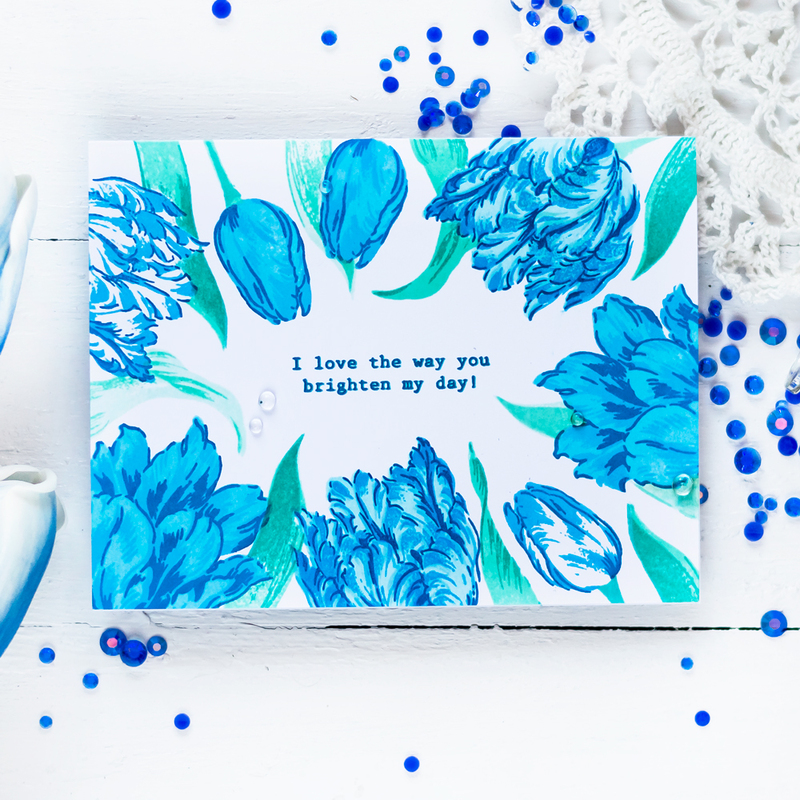 For my first card, I went with a one-layer design, stamping kind of a floral frame around a horizontally oriented A2 card. I made the card base out of a Classic Crest Solar White Cardstock. 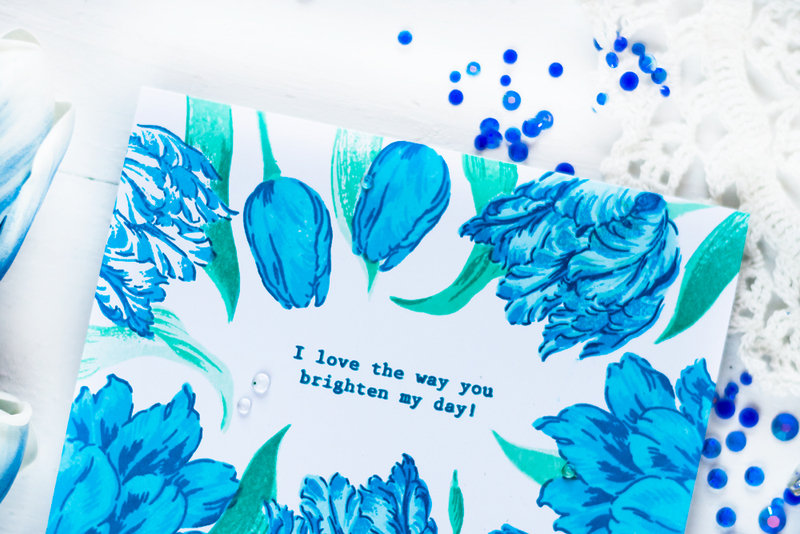 The design was stamped using dye inks from the Deep Blue Seas Oval Set. 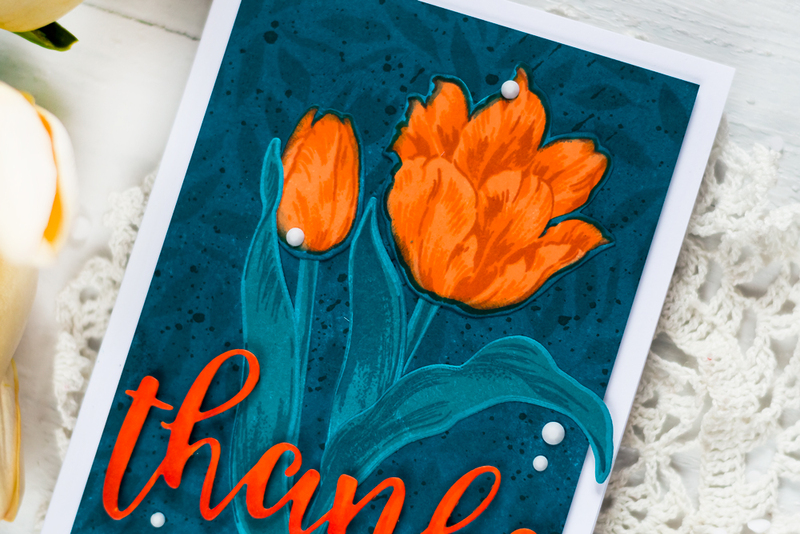 Each flower of this set has three layers, I was alternating the colors from the ink set to make tulips of different shades. For some, I was skipping the bottom layers to achieve white flowers with a blue pattern. 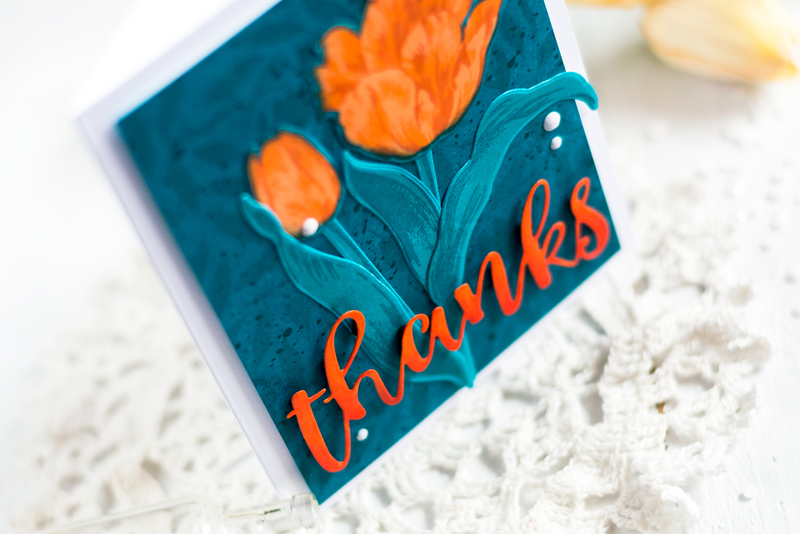 When I stamped the flowers, I was placing them in such a way so they don’t overlap. So no masking was involved on that step. Next, I stamped the stems and leaves, using Mountain Mist, Volcano Lake and Lagoon Crisp Dye Inks. These elements all have two layers each and I was alternating inks to get elements of two shades, darker and lighter. 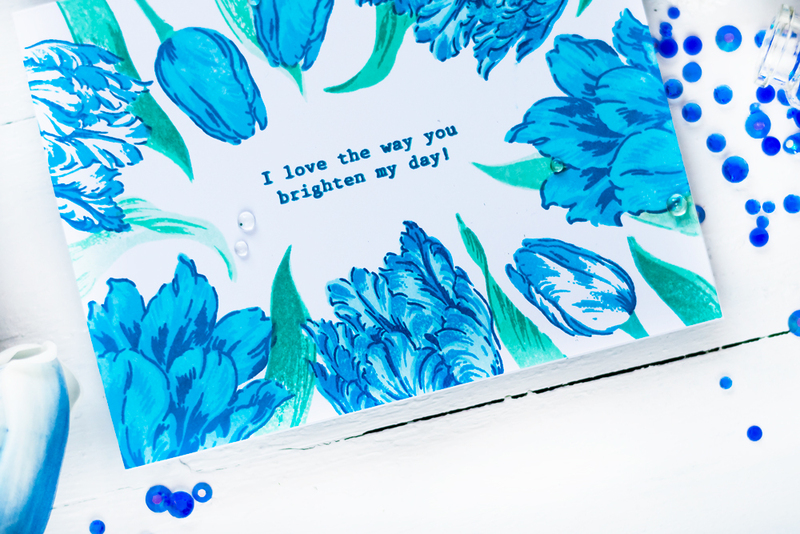 To finish off the card, I stamped the sentiment in the middle and added several clear droplets. For my next card, I went a bit more layered and more complicated. 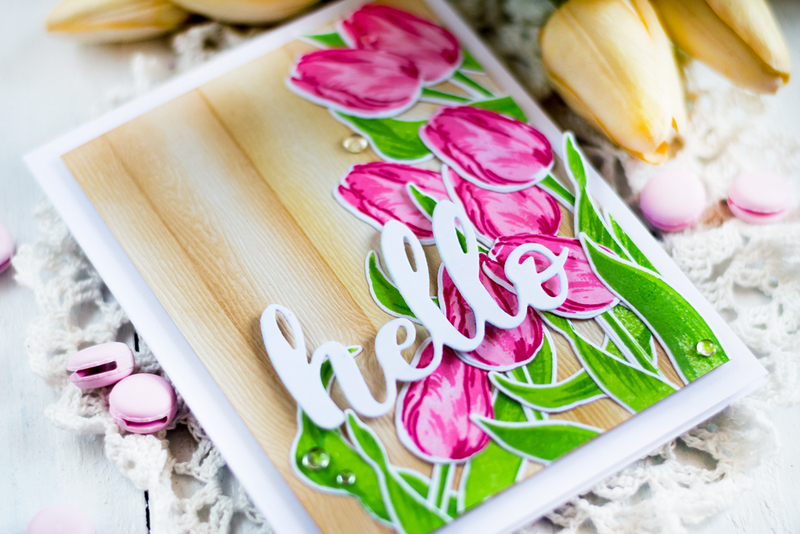 To start off, I made a lot of tulips of the same design (the smallest one from the set) as well as leaves and stems. First, I die cut all elements out of white cardstock using the coordinating dies. 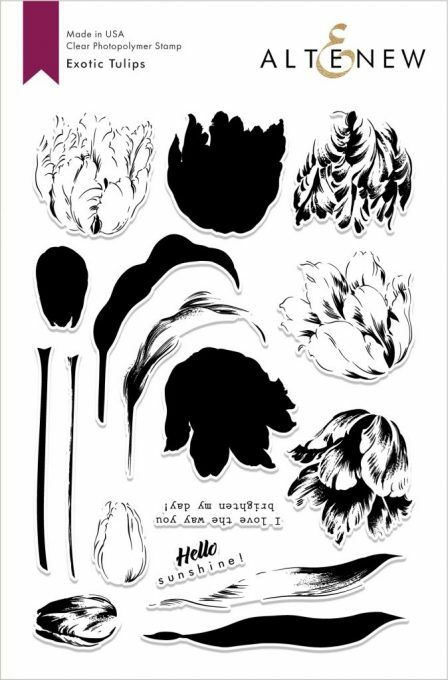 I did 8 die-cuts of the tulip head and about the same about of each leaf and stems. Next, I placed each element in a corresponding negative space in the paper piece they were cut out of, which was inside on my mini MISTI. Then I stamped each layer on all elements, replacing them in the negative space. After that, I moved on to the next layer. This made producing such number of elements a pretty quick task. Die-cutting all of them didn’t require a lot of attention and I only was aligning each stamp once to stamp all the elements. To stamp the heads, I used Cotton Candy, Coral Berry, and Ruby Red Crisp Dye Inks, for stems and leaves, Grass Field and Shadow Creek Crisp Dye Inks were used. Then I cut a panel out of a Woodgrain Powder Cardstock and made wood planks onto it. I was masking off an inch-wide area using two pieces of a painters tape and blended between the tape strips with Sand Dunes and Rocky Shore Crisp Dye Inks. Then I masked off an inch-wide area next to it and did the same. And so on. I adhered all stamped die-cuts onto the panel and then foam mounted the panel onto a white card base. 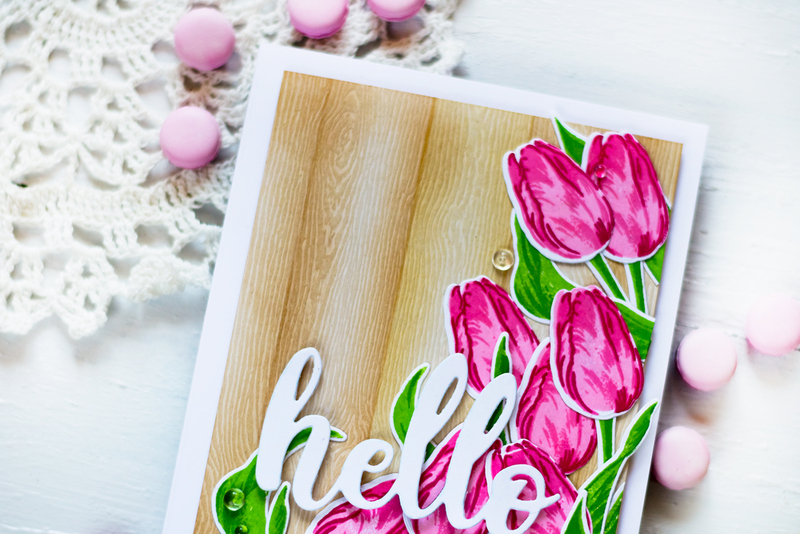 Finally, I die cut a sentiment using the Simply Hello Die and popped it onto the card, which I finished off by adding several clear droplets. 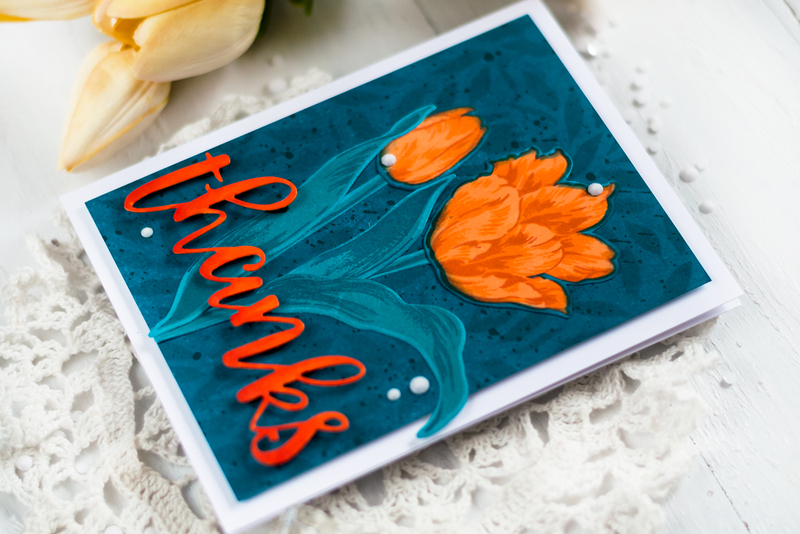 My last card I made using a rather bold color combo of teals and oranges. I started by coloring a white panel by pressing a Galactic Stream Crisp Dye Ink onto it until I covered the whole panel. Next, I blended the same ink onto the panel through the Spring Garden Stencil. 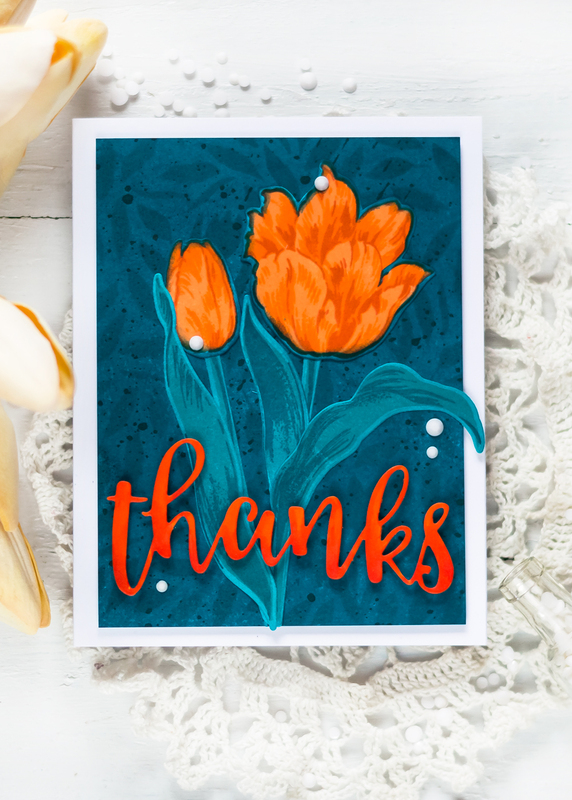 I stamped two tulip heads using Orange Cream, Autumn Blaze and Firebrick Crisp Dye Inks. Next, I “color” the area around the stamped images by blending Galactic Stream Crisp Dye Ink. I masked the flowers using the matching mask stencils. After that, I die-cut them using the matching dies. For leaves and stems, I went simpler. I first blended the Teal Cave Crisp Dye Ink onto a white panel, die-cut the elements, and stamped onto them using the Teal Cave and Galactic Stream Crisp Dye Inks. I foam mounted the panel onto a white card base and adhered the elements onto it using a liquid adhesive. 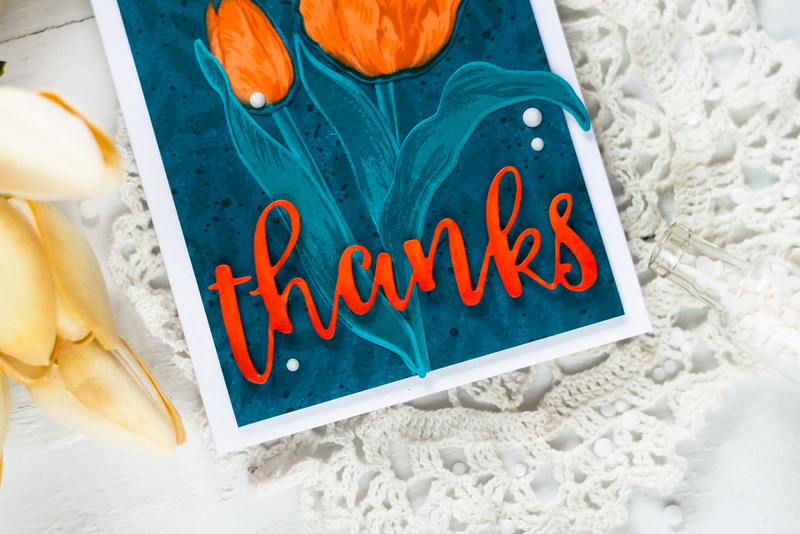 I die-cut a sentiment out of white cardstock using a die from the Script Words 2 Die Set and colored it using Firebrick and Autumn Blaze Artist Markers. After that, I foam mounted the sentiment onto the card using black adhesive foam. Lastly, I added several Snow Crystals onto the card. 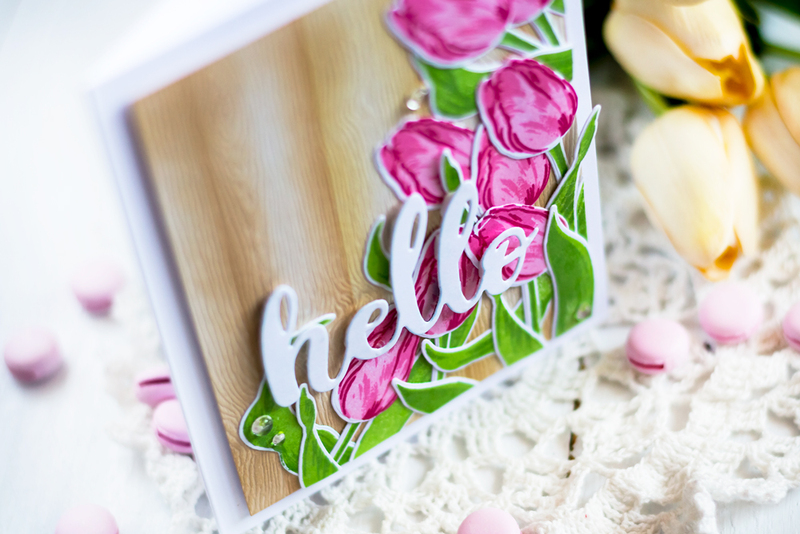 Below you can find the process video where you can see how this card was made. Your tulips are gorgeous.. Tulips are not blooming yet here in Virginia, but saw a vase of pretty real tulips at the dentist today. Then I get home and see your wonderful cards and get to watch your video. I am partial to,the pinks ones, I have to confess. Love your videos Svitlana!. Какая красота! Надеревянном фоне – классика! Очень интересные оранжевые тюльпаны -необычное и оригинальное сочетание цвета. Your cards are always so striking. Your work is so vibrant and colorful. Makes me think spring is really on the way! 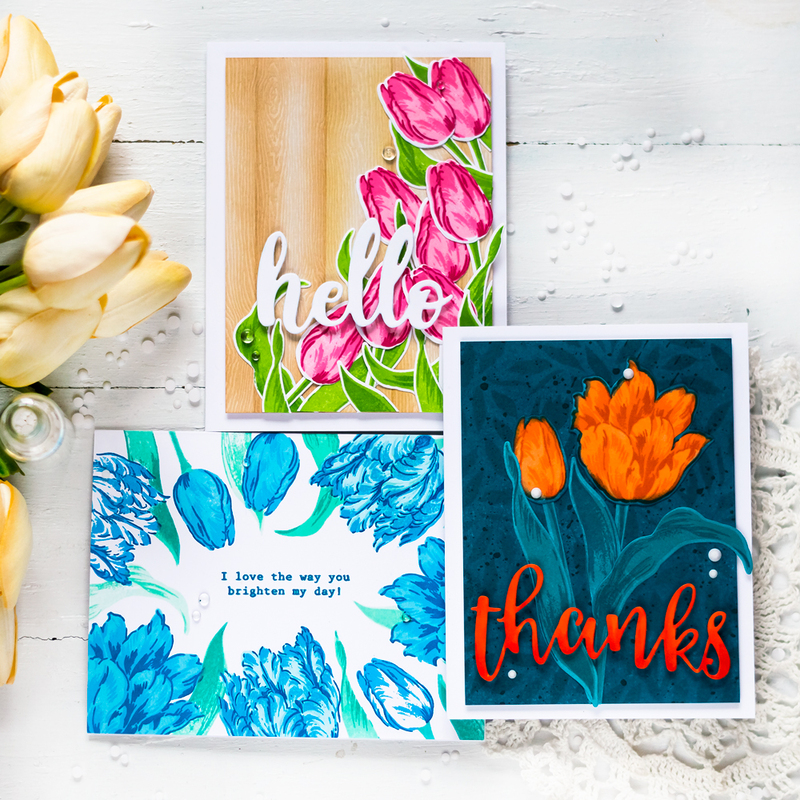 Oh, the tulips are pretty! Hoping it’ll warm up one day here so we can see them.